Christina was in the Doll & Pet Parade dressed up like Pebbles. She looked very cute. I will soon be back on track with slideshow pictures of Christina. 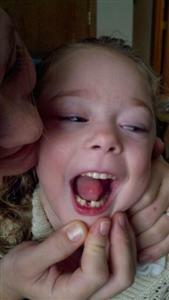 Christina's tooth coming in has given her some discomfort once in awhile. Nothing Anbesol and Motrin can't relieve. There were some sore spots that showed up on Christina's belly and chest that looked like bug bites, but were gone within a day. Christina's IEP was on Friday and went well. We are working on a more focused plan for her. I had a hard drive fail. The drive had 1.85TB of data. All the pictures were backed up along with videos. I also found an old copy of the music and saved that. I did loose the movies that I had saved for watching on the network. The drive failure set me back on pictures and updating the slideshow. I should be back on track in a week or two. It's been a busy time. Couple friends moved and I gave a small hand. Christina has wanted to go go go. The holiday came and went. For Easter we went to grandpa's house. Last weekend we went to the Children's Museum on Saturday. We colored eggs and made cookies. And we have been walking a lot outside in the gait trainer. This morning Christina lost her first tooth. She was super excited. Christina lost her first tooth today. The princess is super excited. She lost a tooth on the bottom. And, there is another tooth that is loose on top. My little girl is growing up so fast. Christina has wanted to walk a lot. Anywhere from on the deck, around the block, or to the neighbors she has wanted to go. The usual shoulder rides follow, but Christina has been walking way more than last year to get her ride. Christina has been walking blocks at a time. The princess enjoys walking with the gait trainer and being supported for balance. And to add to the fun, if I am too close to the front of the gait trainer the little princess turns into a monster and picks up speed to run me over. When she gets close enough Christina cracks up laughing. And laughing so hard she stops if she manages to catch my ankles. For now I'll take my ankles getting hit if it means Christina will give that extra push. Christina also enjoys going 'off-road' with her gait trainer. She can't make it on her own over the grass and hills, but really likes the tough terrain with help. Keeping a steady pace, Christina lifts her legs high and walks wonderfully across the tough stuff. The little dips in the yard just give more reason to enjoy. The wagon rides are still a big hit. We a also brought the bubble maker along on one ride. Christina wasn't too interested with the bubblews until we stopped at the neighbors and she showed them how it works. Then on the ride back she blew bubbles the entire way. Most of them blew in front of her with the breeze so we were going through a cloud of bubbles. Christina also asked for extra phone time on Sunday. With her beautiful walking the last week I agreed and let the big little girl chat away. Christina did very well at her first session of aquatic physical therapy. Jeff, her instructor, did a great job with her. I am confident Christina will benefit from the sessions. I am always a little concerned when starting with a new person. Jeff was calm and steady with Christina. Before the session was done Christina even gave him a kiss. Christina showed similar signs to when we are in the pool together. It did not take her long to relax enough to enjoy the water. Christina had her first aquatic physical therapy on Tuesday. Christina did wonderful. It started with crying, but did not take long for her to relax and enjoy the water. Jeff did a great job. It shows that he has worked with kids before. We will give this round of sessions a try and see how it goes. I think Christina will continue to do great and will enjoy her PT time in the water. Christina has also been walking super well in the gait trainer. Again she makes quick work of the deck. The princess waked for an hour and a half straight last Sunday. That did not stop her either. Christina was super excited to play outside all weekend. I read the first part of a blog yesterday and it interested me. I was at work so I printed it so I could read it better. It hit close to home. More like it hit too close. I made it through a few paragraphs and had to stop. It is not an article I can read while at work. Many of the items Julie describes I also do with Christina. Makes me think about that precious time I spend with the princess. Here are a few photos from Christina's last hospital visit. A couple of the doctors. The snow that came really set me back with stuff around the house. And I had more pictures than usual. Today I shall get caught up. Laundry almost done. Dishes were done so there is not much more. Pictures uploaded to Christina's blog. Snow blower broke and is fixed. Ugh. I am not a fan of small engine repair. Next put the laundry away and then send more thank you's.